Our trips are designed so you can experience the most scenic regions of Ireland,at a very different pace. Our routes have been selected based on their natural beauty and cultural interests. We plan your path so you can enjoy your adventure! At IrelandWays.com we are always happy to customise our itineraries for your hiking in Ireland tour or cycling holiday: whether you want to stay additional nights before, during or after your walk; if you wish to upgrade your accommodation or if you’d like to include additional activities in specific locations. We take the stress out of researching and planning your trip, taking care of every tiny detail involved in organising and of course booking your hiking in Ireland adventure or cycling holiday. Needless to say, we cater for every individual, every level of fitness, building your trip around your needs. Customer care is of utmost importance to us. Our team are always available to help you before, during and after your holiday. Before your trip, you can use our free, no strings attached ‘Request A Quote’ service. You can do so by phone during office hours on +353 (0) 1 525 2886, by email info@irelandways.com at any time or by using the IrelandWays.com Contact form. We will reply within one business day (please note our office is based in Dublin). Our customer service team can also advise you on any administrative formalities you may require such as visas, etc. On our website, you can research your walking trip and book it whenever you like. 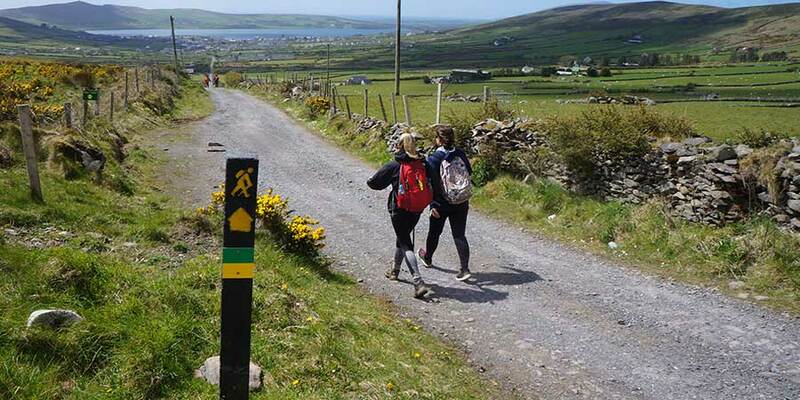 The walking notes for our self-guided hiking in Ireland trips and your guide in a group trip or guided tour can help you with any queries that you may have, however, we will also supply you with a support phone number you can access 24/7 while on holiday. To ensure your safety and to help you to choose the right holiday for your fitness level and experience we have graded all our walks from 1 (easiest) to 5 (challenging). In addition, all the accommodations booked are comfortable and welcoming, ensuring that you are well looked after. We assess the quality of our holidays according to your satisfaction. It is for this reason that we ask you to fill out a feedback survey (Feefo and TripAdvisor) when you return home so that we can continuously improve our services. Your opinion is important to us. In addition, you can keep up-to-date with our latest news and special offers through the IrelandWays.com Blog and Newsletter. Loyal customers also get special discounts for all future bookings with us!